Sophie Gengembre Anderson (1823–1903), Scheherazade (date not known), oil on canvas, 51 × 42 cm, The New Art Gallery Walsall, Walsall, England. Wikimedia Commons. For many centuries, almost universally male artists had painted motifs for almost universally male patrons and viewers. In those works, women tended to be young, beautiful, and commonly naked at times when nakedness in real life was deeply sinful. Men tended to be male role models: Heracles/Hercules, Jason, Aeneas, Saint George, who fought, killed, and showed off their prowess. The only family shown with any frequency (apart from in family portraits) was the Christian Holy family, who provided one of the few opportunities to show infants and maternal love. There were a few exceptional women painters who against all odds were able to establish themselves successfully, but it wasn’t until the late nineteenth century that significant numbers of women were allowed to train to paint, and were able to select their own motifs. One of the first of those pioneering ‘new woman’ artists was Sophie Gengembre Anderson (1823–1903). Born in Paris as Sophie Gengembre, the daughter of an accomplished French architect and his British wife, when she was young the family had to leave the city, and they lived in rural parts for over ten years. When they were able to return to Paris in 1843, she studied portrait painting with Charles de Steuben, but he soon left for Russia, and she was left to learn by herself and with the assistance of friends. When King Louis Philippe was overthrown in the 1848 Revolution, the family fled France for America. They initially settled in Cincinnati, OH, and later moved to Manchester, PA, where Sophie Gengembre is believed to have married Walter Anderson, a portrait painter. At that time she worked as a chromolithographer, but developed her own portraiture business and assisted her husband. Sophie Gengembre Anderson (1823–1903), No Walk Today (1856), oil on canvas, 49.5 × 39.5 cm, Private collection. Wikimedia Commons. The couple moved to London in 1854, where Sophie exhibited at the Society of British Artists (in 1855), and at the Royal Academy. In this period, she painted the delightful No Walk Today (1856), which was purchased in 2008 for over £1 million. 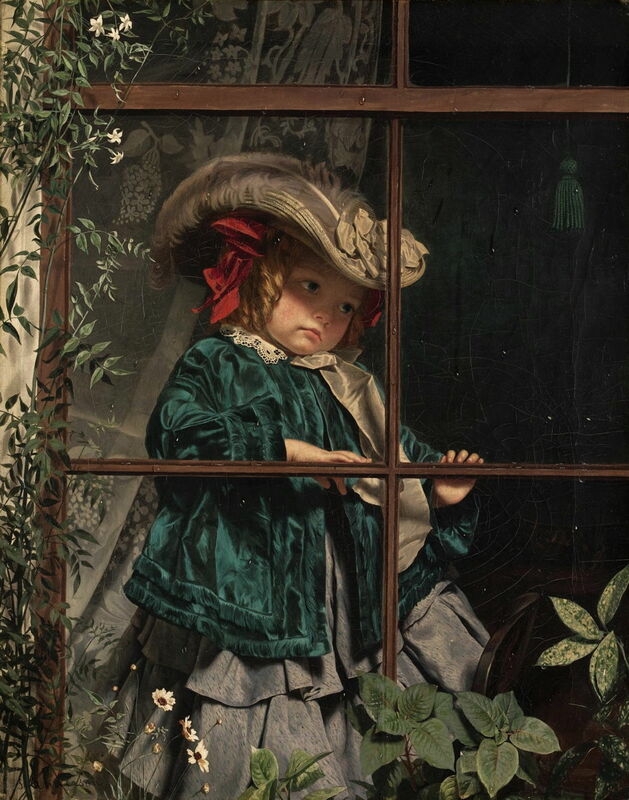 It shows a small girl, dressed up in highly fashionable clothing, looking sadly and wistfully through a window. The clear story is that she is not able to go out for a walk, although dressed for it. This is something of a ‘puzzle painting’ in that it invites the viewer to speculate as to why the girl should be confined to the house, but gives us very few clues. She is apparently not ill, nor is the weather inclement. She is not dressed in subfuse or mourning clothing, which might have indicated a family bereavement. Sophie Gengembre Anderson (1823–1903), It’s Touch and Go to Laugh or No (1857), oil on canvas, 76 × 63.5 cm, Private collection. Wikimedia Commons. 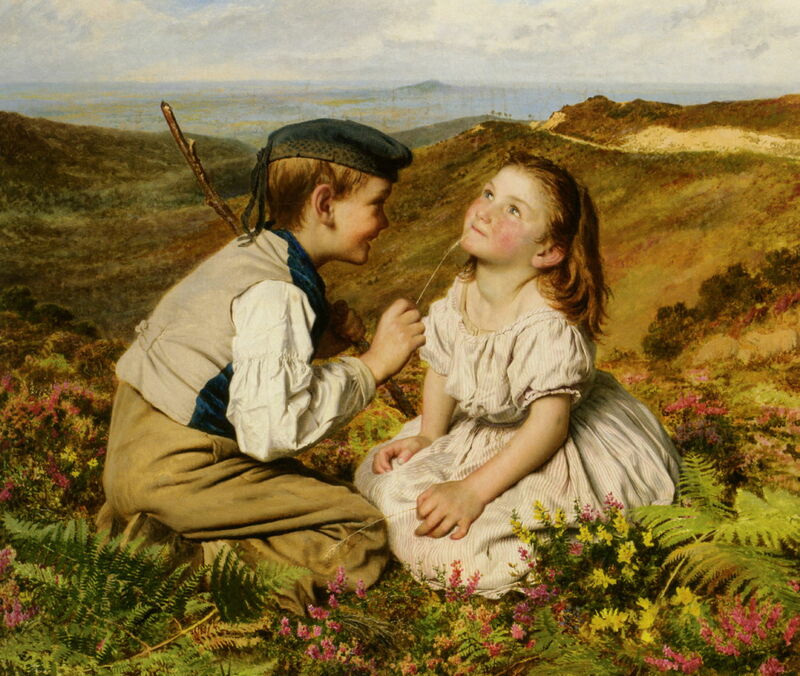 It’s Touch and Go to Laugh or No (1857) is set amid flowering heather in the Highlands of Scotland, although the figures were almost certainly painted in the studio. The young boy and girl are playing a game, in which he is trying to make her laugh by tickling her face with a stem of grass. The children who modelled for this were most probably those of the artist. Sophie and Walter returned to the USA from 1858 to 1863, where they both had work exhibited at the National Academy of Design. They then returned to live and work in London, where Sophie made a successful career, exhibiting with the major institutions including the Royal Academy. Sophie Gengembre Anderson (1823–1903), Girl With Lilac (1865), oil on canvas, 22.3 × 19.4 cm, Private collection. Wikimedia Commons. 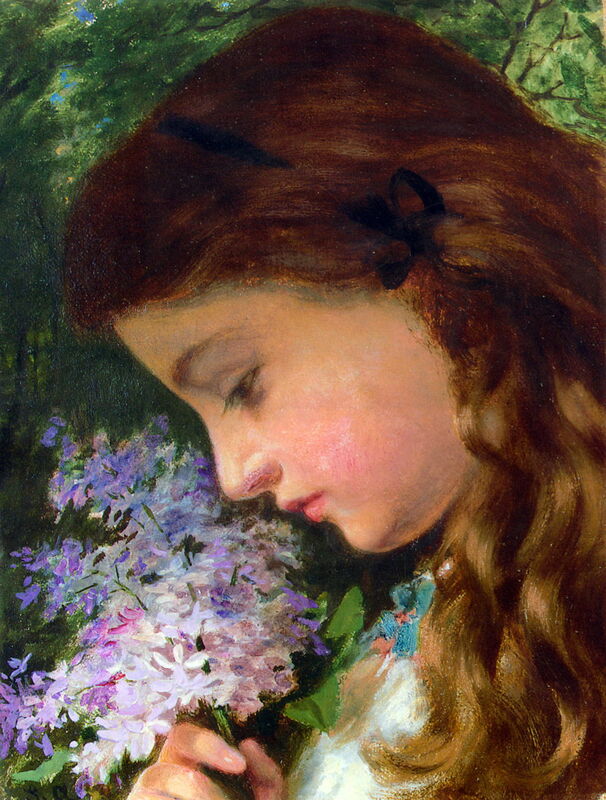 Girl With Lilac (1865) shows a painterly if not sketchy style, for a simple and beautiful portrait of a young woman holding a bunch of lilac flowers. Sophie Gengembre Anderson (1823–1903), The Song of the Lark (1865), oil on canvas, 43.5 × 53.5 cm, Private collection. Wikimedia Commons. The Song of the Lark (1865) appears to be another studio portrait against an idealised landscape background, set in rolling countryside with a substantial church peeping from the woodland. This young woman has been picking buttercups and daisies, which are scattered on her lap. She looks up, wide-eyed, at an unseen object high in the sky, perhaps indicating her aspirations for the future. Sophie Gengembre Anderson (1823–1903), Elaine (The Lily Maid of Astolat) (1870), oil on canvas, 158.4 x 240.7 cm, Walker Art Gallery, Liverpool, England. Wikimedia Commons. One of Anderson’s most fascinating paintings is among her best, and best-known: Elaine or The Lily Maid of Astolat (1870). She exhibited this in Liverpool, at the first Autumn Exhibition there, where it was very well-received, and was purchased for the city, becoming the first work by a woman artist to enter the Walker Art Gallery collection. It shows the corpse of Elaine of Astolat being rowed by a servant to Camelot, after she had died of a broken heart for her unrequited love of Sir Lancelot. Her body is ghostly white, and holds lilies as a sign of virginity, and her parting letter to the knight. The story has many similarities with another popular Arthurian legend of the Lady of Shalott, and is often confounded with it. 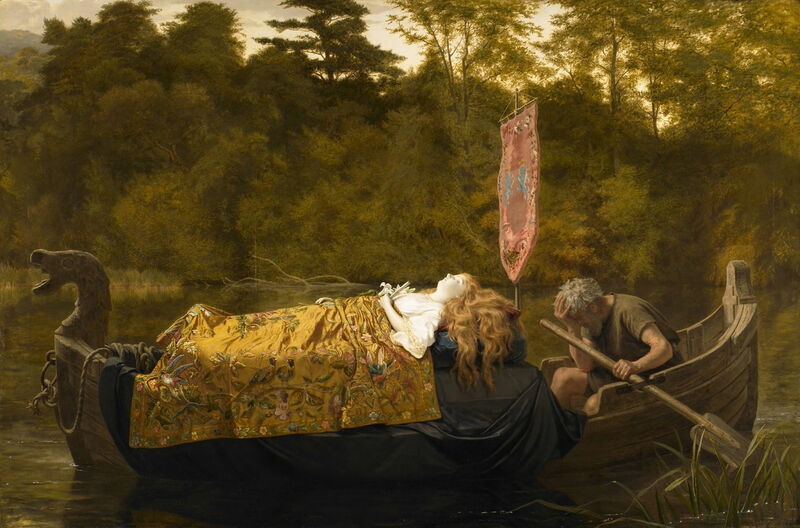 Anderson’s painting is similar in some respects to contemporary depictions of the Lady of Shalott, but differs in important details. I will examine these in an article tomorrow. In 1871, the Andersons moved to Capri, which was then something of an affluent artist’s colony with residents such as Frederic, Lord Leighton and John Singer Sargent. Sophie Gengembre Anderson (1823–1903), Take the Fair Face of Woman, and Gently Suspending, With Butterflies, Flowers, and Jewels Attending, Thus Your Fairy is Made of Most Beautiful Things (1880), oil on canvas, dimensions not known, Private collection. Wikimedia Commons. 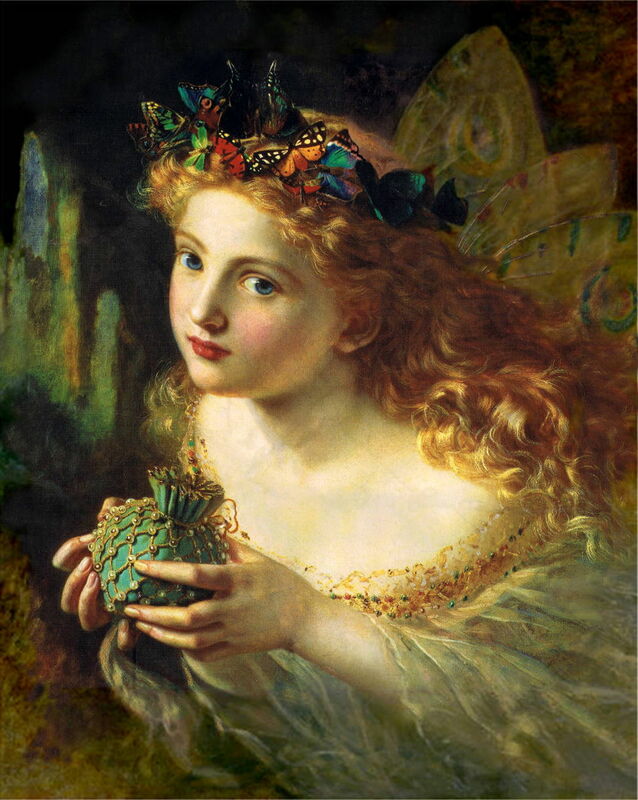 Sophie Anderson entered the faerie painting sub-genre with Take the Fair Face of Woman, and Gently Suspending, With Butterflies, Flowers, and Jewels Attending, Thus Your Fairy is Made of Most Beautiful Things (1880). The title is taken from some verse allegedly by Charles Ede, but the only literary person of that name who I can identify was born long after this work was painted. Sophie Gengembre Anderson (1823–1903), Heavenwards (1883), oil on canvas, 35.6 × 30.5 cm, Private collection. Wikimedia Commons. Heavenwards (1883) is the last dated painting that I have to show here, and demonstrates the loosening of her brushwork towards the end of the century. 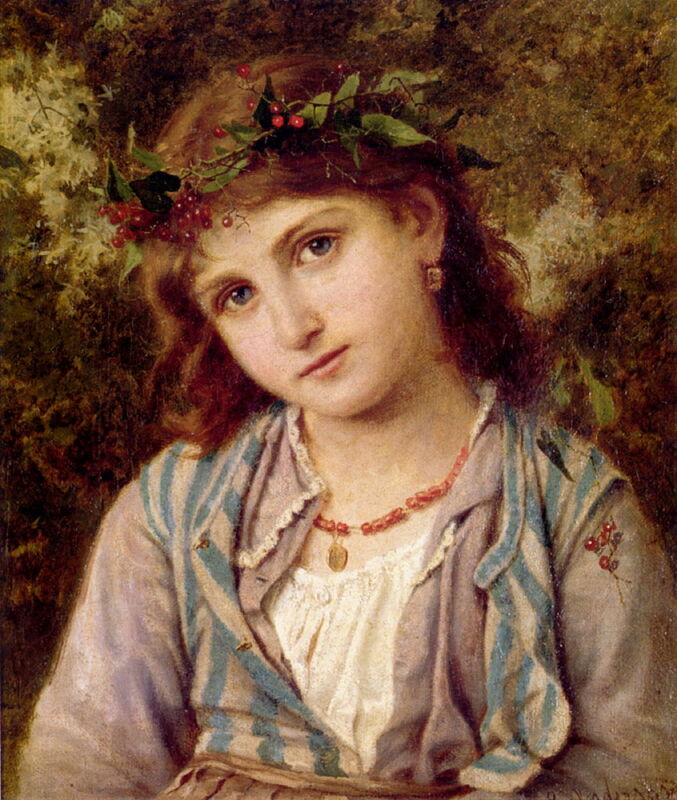 Sophie Gengembre Anderson (1823–1903), An Autumn Princess (date not known), oil on canvas, 30 × 36 cm, Private collection. Wikimedia Commons. Although Anderson’s genre paintings and portraits avoid any overt display of poverty, An Autumn Princess wears her modest clothing in gentle disarray, and her string of beads has seen better days. 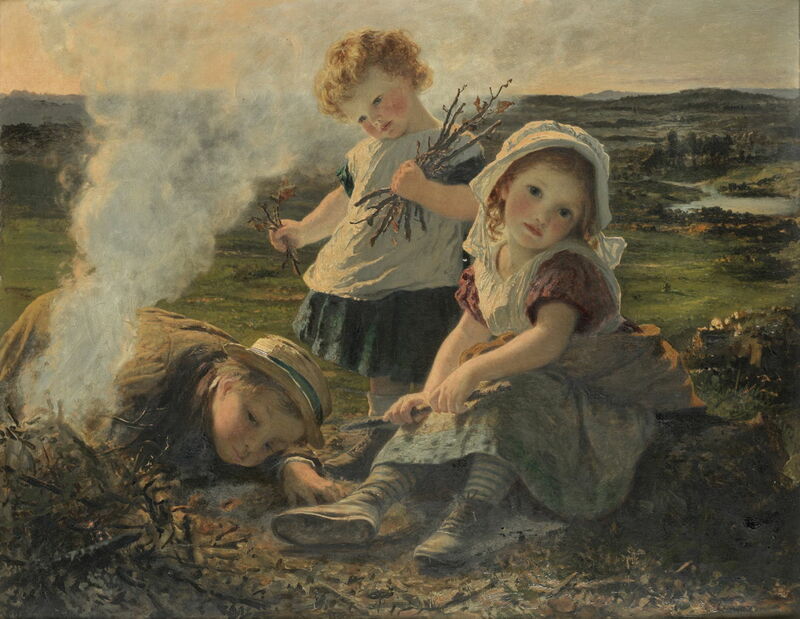 Sophie Gengembre Anderson (1823–1903), The Bonfire (date not known), oil on canvas, 71 × 92 cm, Private collection. Wikimedia Commons. The Bonfire appears to be another composite with figures painted in the studio, children who are getting a bit grubby poking around in the embers of a small bonfire. The background could be almost anywhere in England or Wales, but there is a suggestion of another bonfire in the right distance, which might time the scene to Bonfire Night, 5th November. 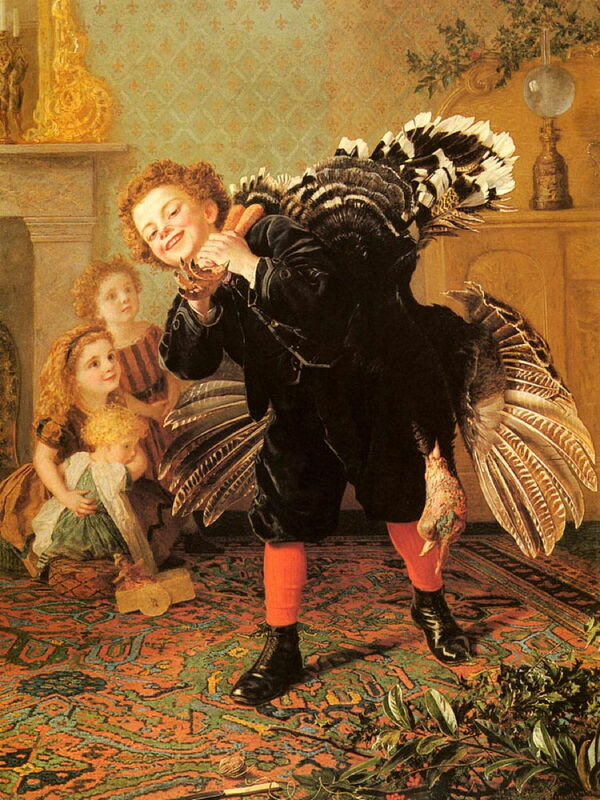 Sophie Gengembre Anderson (1823–1903), Christmas Time – Here’s The Gobbler! (date not known), oil on canvas, 112 × 84 cm, Private collection. Wikimedia Commons. There is no doubt, though, about the season in Christmas Time – Here’s The Gobbler! which shows a proud boy carrying in a huge turkey destined for Christmas lunch. That and the decor places this in a comfortably middle-class home. Sophie Gengembre Anderson (1823–1903), Her Favorite Pets (date not known), oil on canvas, 41 × 51 cm, Private collection. Wikimedia Commons. 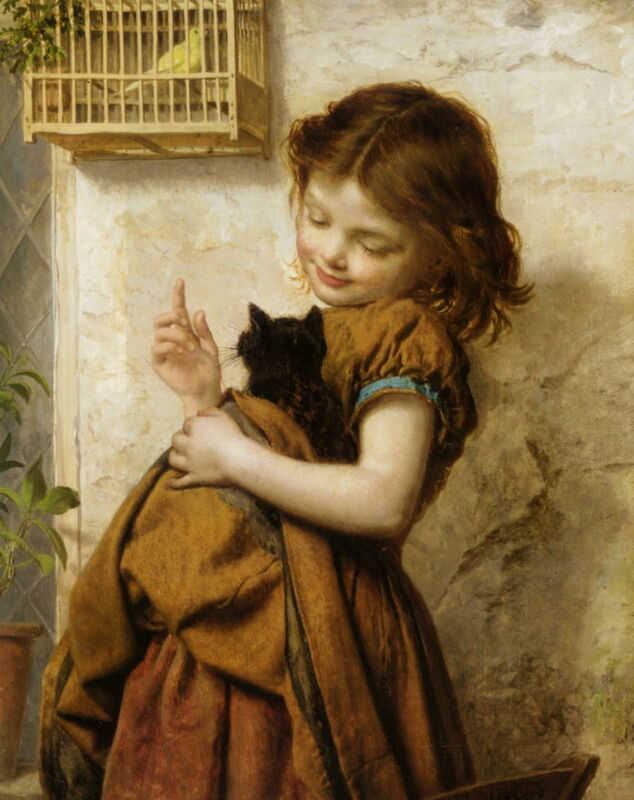 Her Favorite Pets is one of several paintings that Anderson made showing children with their pets – here a black kitten, who is sizing up the canary in the cage at the top left. During her years living on Capri, Sophie Anderson painted many works showing local people. 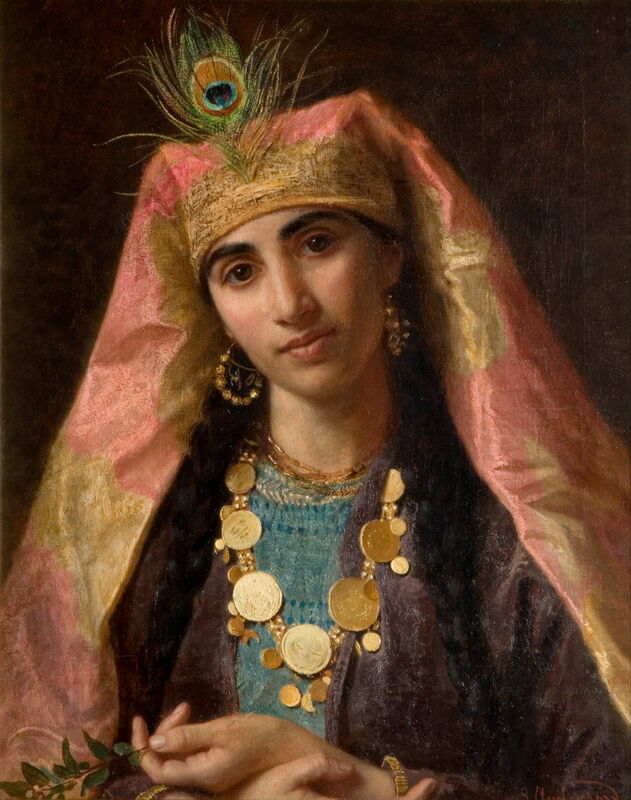 There is no evidence, though, to suggest that she travelled to the Middle East where she might have painted Scheherazade, the storyteller in One Thousand and One Nights, but the Victorian fad for Orientalism made this a popular motif. Sir Richard Burton’s translation of these stories was published in 1885, suggesting that Anderson probably painted this portrait soon afterwards. 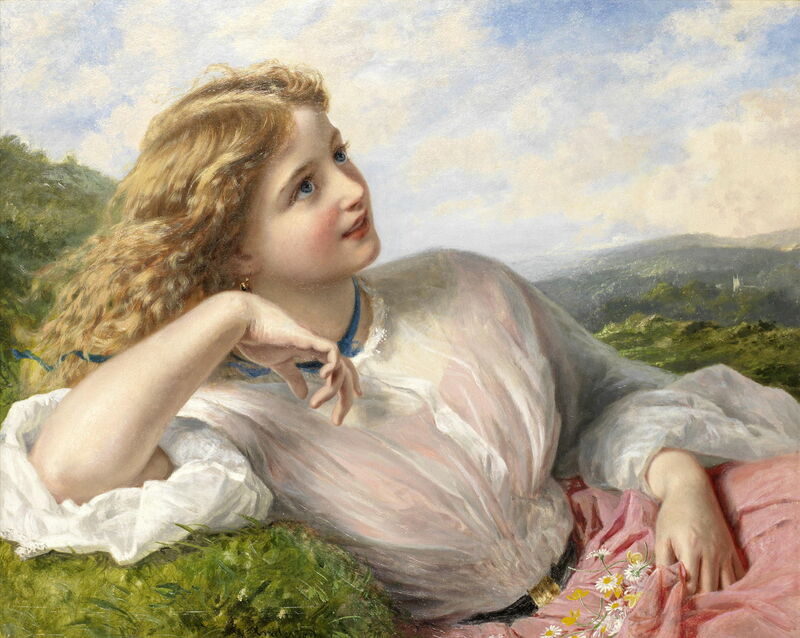 Sophie Gengembre Anderson (1823–1903), Wait for Me! (Returning Home from School) (date not known), oil, dimensions and location not known. Wikimedia Commons. Wait for Me! 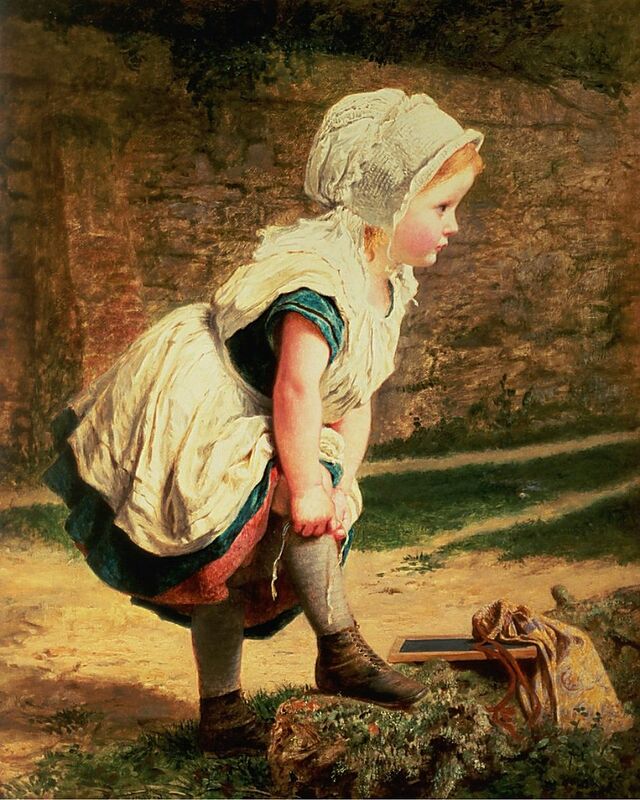 or Returning Home from School is one of Anderson’s most wonderful child paintings, showing a little girl trying to get herself together for the walk back home after school. By her school bag is a small chalk tablet which she would have been using to learn to write, and more, before graduating to an exercise book and pencil. In 1894, Sophie and Walter returned to the UK, settling in Falmouth, Cornwall, which was (and remains) an artists’ colony predating that nearby at Saint Ives. They both died there in early 1903. 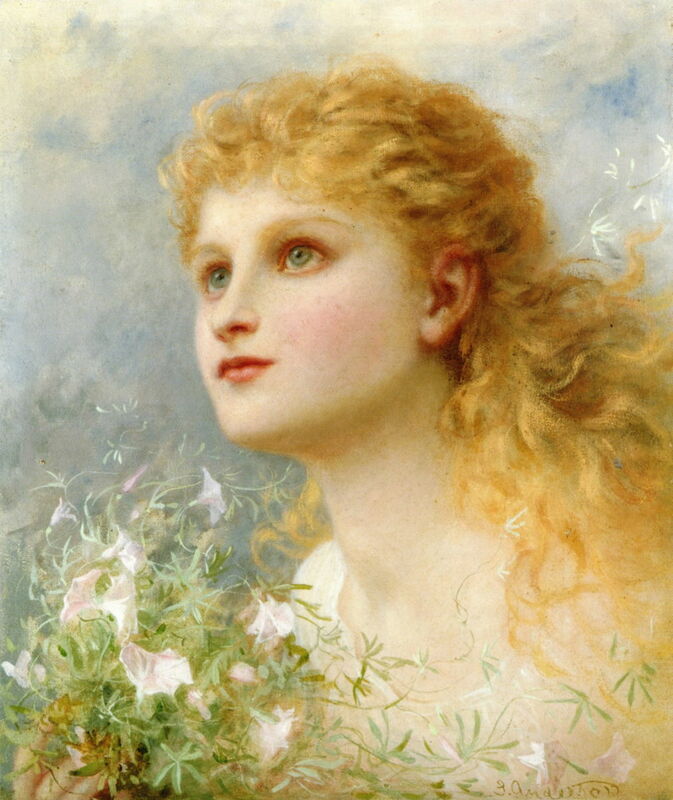 It’s easy to dismiss Sophie Anderson’s paintings as women’s eye-candy, perhaps. If that is the case, then we must write off most paintings by male artists as men’s eye-candy. At the time, it was pioneering, exploring the motifs which interested other women, and which would be aspirational for middle-class women whose role was in the home and family. Her paintings may not have the narrative or symbolic depth of some made by other women and by men, but they remain beautiful, accomplished, and significant works of art. Posted in General, Painting and tagged Anderson, Arthur, children, legend, Leighton, painting, PRB, Pre-Raphaelite, Sargent, women in art. Bookmark the permalink. I was not aware of Sophie before this morning…and I am delighted. The quality of the representations is quite good and perfectly suitable to make powerful impressions on someone like myself. The subject matter of your article: Sophie’s life which involved the stress of the political climates and frequent moves, not to mention the difficulty in finding artistic training; the paintings themselves…the details from skin tone to flowers, the colors and relative intensities, the dynamics; the subject matter of her paintings from death and tragedy to whimsy. I am inspired by her tenacity and determination to produce. But the subtle manner in which you handle a cultural ill without bashing us over the head is remarkable and commendable. You are an artistic master in your own right; like any of these paintings, your article presents the main subject: ‘Sophie’s paintings,’ but with effectively handled ‘light’ and tension, scattered about in the background are small ‘mentions’ that inform our perception of the world. Well done, sir. It grieves me deeply as to how little-known women artists are still. Sophie’s paintings are a lot more accessible than many, but so few have been bought for major collections, so the chances of those visiting galleries and seeing her wonderful paintings are extremely small. One day, maybe, she and the many other superb women artists will get a fair viewing. Why has no one done that…arrange a female artists’ show? I suppose we have waited too long for now, the likes of my son would cry “Foul! Male discrimination !” What a crazy world we live in. There have been, but limited in scope. I went to one in Paris some years ago, but it ignored anything prior to the 20th century. There are also some specialist collections of women’s art – a couple in the US, I believe. These are small, bold attempts to redress the balance, but infrequent and have had sadly little impact. The major public collections – many of whose senior and most talented staff are women – need to move on from the traditional model of overwhelmingly men’s art for men. They should be deliberately buying in some of the superb works by the many major women artists. Let’s break the centuries-old mould, and enjoy art which better reflects the whole of society, not just the half that previously controlled it.